Japanese Court Orders Payments To Plaintiffs Over Fukushima Disaster : The Two-Way It's the largest ruling of its kind over the Fukushima Dai-ichi nuclear power plant, totaling nearly $4.5 million. A Japanese court has ruled against the government in the largest case yet over the Fukushima nuclear disaster. 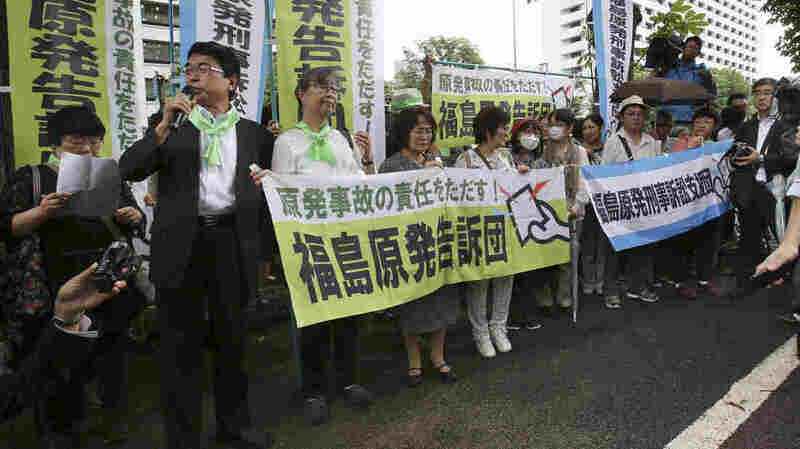 In this file photo from June, plaintiffs of civil lawsuits held a rally in front of Tokyo District Court prior to the start of a criminal trial over the disaster. A Japanese court says the government and Tokyo Electric must compensate people in Fukushima for their suffering in the 2011 nuclear power plant disaster, saying officials should have been prepared for a potentially ruinous tsunami. It's the largest ruling of its kind over the Fukushima Dai-ichi nuclear power plant. In holding the government and TEPCO liable in the class-action lawsuit, the Fukushima district court ordered payments totaling nearly $4.5 million to about 3,800 plaintiffs — roughly $1,184 per person. As John Matthews reports for NPR's Newscast unit from Tokyo, the court decided that "the government and the utility failed to act on a 2002 report that predicted a 20 percent chance of a major earthquake triggering a tsunami in the following 30 years." In 2011, an earthquake and tsunami caused multiple meltdowns at the nuclear power plant, forcing the evacuation of thousands of people. Some of them have only begun to return home, as cleanup crews and engineers try to cope with radioactivity in the water and earth. Such work will continue for decades. The plaintiffs include people who stayed in Fukushima, along Japan's northeast coast, according to Japan's NHK News. The agency adds, "More than 12,000 people across Japan have filed class action lawsuits over the accident with courts in 18 prefectures." The ruling marks the second time a district court has held the government liable in the disaster. The first came in March — days after the catastrophe's sixth anniversary.